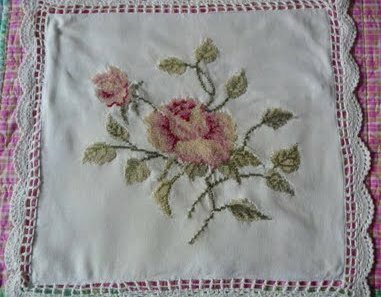 Years ago I fell in love with this beautiful rose-stitched lace-edged pillow covering. In fact I loved it so much I bought more than one so I could give them as gifts to my mom and aunty. I loved using it in my rose-burgundy living room. As time passed, I married and moved and our home's color scheme changed. Although I let go of other rosy items, I could never quite let go of this rose! Brenda, anything that incorporates roses is perfection for me! They are my favourite flower and my garden is full of them. I'm not sure how you can bear to part with this beautiful item. I would treasure it in my bedroom, a room with a rose theme! I am glad to be a a follower. Omigosh, Brenda, are you sure? That is so lovely. I think I'd place it front and center on my bed, if I were to win. Vee, I'm sure.... knowing that it will be going to a beautiful home where it will be enjoyed is all the incentive I need. Elizabeth... you and my mom would get along perfectly. She also loves all things roses! She tried one year to say, okay that enough roses, but that's still where her eye goes, to any rose-related themes. I say you can't go wrong with such a passion! Best to you both on the draw day! It would go so nicely in our guest room. Flowers, pink, perfect! Yes, I follow you. Has it been 3 year? it's lovely, i'd put it in my aquamarine bedroom it would just match...i have you in my blog buddies list. That is such a lovely give away and the piece is so pretty. I won't join in though since I live Down Under!